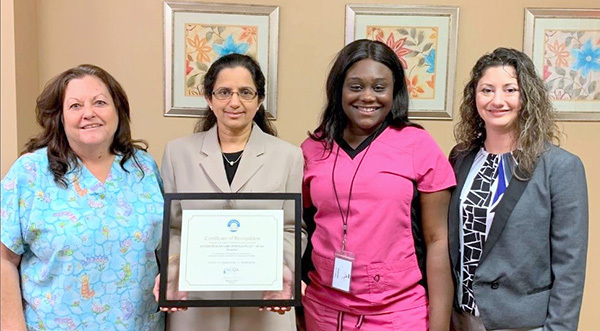 Pasco, Hernando & Pinellas Counties, Florida (February 6, 2019)– Access Health Care Physicians, LLC, is proud to announce that Akila Iyer, MD, board certified in internal medicine, and her team have achieved recognition under the National Committee for Quality Assurance PCMH Recognition Program. The National Committee for Quality Assurance will list Dr. Iyer and her location on its website with a recognition seal. Dr. Iyer and her team practice at 2626 Tamp Road, Suite 204, Palm Harbor, Florida 34684. Call 727-781-5811 to schedule an appointment. New patients are always welcome. The National Committee for Quality Assurance (NCQA) reviewed the submission, and the practice has received the NCQA Patient-Centered Medical Home (PCMH) Recognition for using evidence-based, patient-centered processes that focus on highly coordinated care and long?term, participative relationships. Earning PCMH recognition is a distinction in which a practice can take pride. The NCQA Patient-Centered Medical Home is a model of primary care that combines teamwork and information technology to improve care, improve patients’ experience of care and reduced cost. Medical Homes foster ongoing partnerships between patients and their personal clinicians, instead of approaching care as a sum of episodic office visits. Each patient’s care is overseen by clinician-led care teams that coordinate treatment across the healthcare system. Research shows that Medical Homes can lead to higher quality and lower costs and can improve patient and provider-reported experiences of care. NCQA is a private, non-profit organization dedicated to improving health care quality. NCQA accredits and certifies a wide range of health care organizations. It also recognizes clinicians and practices in key areas of performance. NCQA’s website (www.ncqa.org) contains information to help consumers, employers and others make more informed health care choices. Access Health Care Physicians, LLC is a multi-service medical practice consisting of over 185 healthcare providers and over 1,015 employees at more than 125 locations throughout Florida. Our healthcare professionals provide a wide range of services not only in our offices but within patients’ homes. Yes, we make house calls. Prebiotics vs Probiotics – What is the difference?